We remind clients of the piece that we wrote in October about possible pricing actions in the consumer paint space in the US which could undermine earnings for the US architectural paint companies – see research. Today’s announcement by PPG that it is undertaking a major business restructuring is predicated on slow growth globally and a sign that the company does not see a quick recovery and is looking for other ways to drive earnings. Meanwhile paint producers and sellers continue to talk about lower pricing – SHW has major discounts for December – although this is not a strong sales month anyway. Home Depot continues to highlight “lower prices” on its paint pages. While SHW underperformed after its Q3 earnings miss, the stock has recovered as the market has recovered and still looks very expensive in our view. Estimates for Q4 and for 2017 have come down post the Q3 miss and guidance, but they still anticipate revenue growth, which will require meaningful volume growth if prices are down year on year. We would not be surprised to see another revenue and earnings miss from SHW in Q4. The VAL acquisition and integration is still in front of SHW and we would not under-estimate this challenge and the possibility of further earnings issues as a result. PPG looks more reasonably valued and has been a very poor performer in 2016. It is likely that PPG’s Q4 numbers will come in lower than consensus – stripping away the restructuring charges. PPG has been our preferred way to invest in the space given valuation and a view that margins could be improved – however, we see no need to be involved in the sector at all today. 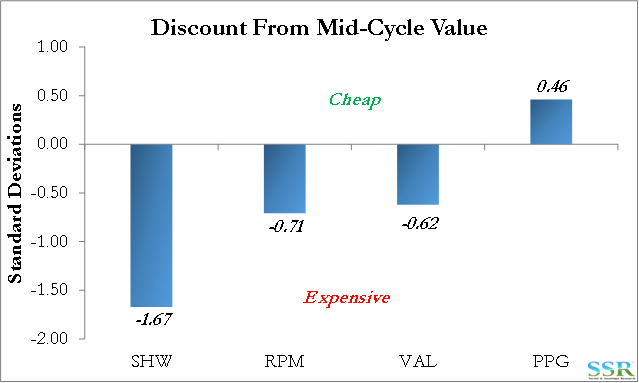 Today’s move suggests a more aggressive approach to costs, but without the volume growth and with weaker pricing the company (as well as SHW and VAL) will not see the high operating leverage that has propelled earnings for the last several years.